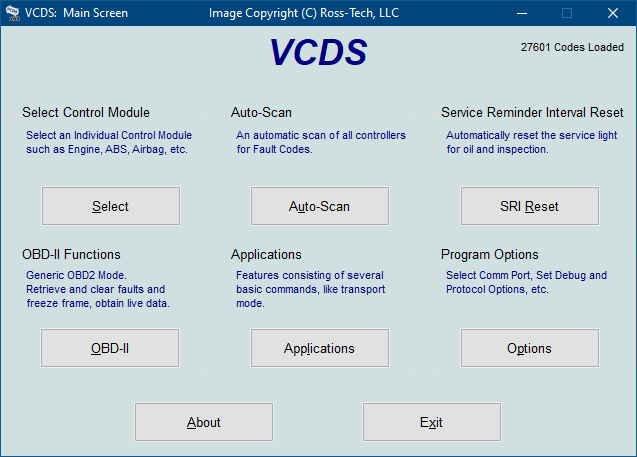 This is an HTML simulation built from actual screen-shots of the latest version of VAG-COM Diagnostic System (VCDS). Windows 7 with the "Aero" style. If you are not using W7 Aero, expect the screens to look different but the functions will be the same. This screen appears when you start VCDS by clicking the shortcut on your Desktop or by selecting VCDS from the Start Menu. In the actual VCDS program, all buttons except Options and About will be grayed-out until you have Tested and Saved your port settings on the Options screen. Click on the buttons in the screen shots to "navigate" through this manual. You can also use the "Manual Index" below (scroll down). This printable version is from 2015 so it will not contain the latest information found in our online manual.